JF: Hi Carol! Thanks for joining us from Ireland! CF: Delighted to be here, it’s always so much fun to be part of Wool People. JF: You began self publishing your own designs in 2007 and have amassed an impressive amount of design work in the 5 years to follow. Can you tell us a little more about what your day-to-day process looks like as an independent designer? CF: My day is divided between designing and parenting. After dropping kids to school I start my workday at home with my mornings devoted to design work and social media. It’s hard to get a balance between the two; marketing and design occupy very different headspaces so I’ll often need a walk with the dog to switch gears. I usually don’t have time to knit in the mornings, that comes later in the day. My afternoons are filled with children’s activities. With 4 boys who are involved in more things than I can list there are some days that I could spend 3-4 hours driving in circles. Fortunately knitting is portable so an hour waiting in one place is a luxury! Once the driving is over and the youngest in bed I get to have my knitting time. I’ve got a spot on the corner of the sofa that’s got all my projects lined up in different bags and a pile of stitch dictionaries on the coffee table that are threatening to tumble. I knit almost all of my own samples (unless I’m very short of time) as I find that some of the best design ideas happen on the needles. 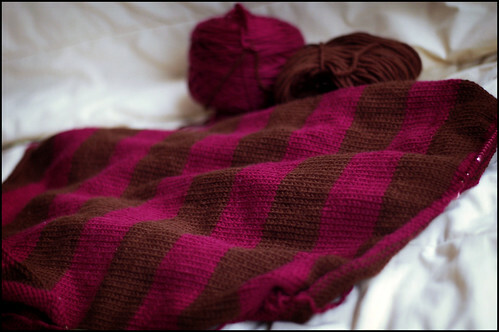 Watching your work as you knit allows you to modify a good idea and turn it into a great one. JF: I agree – it seems that the best design revelations happen when your ideas are taking shape in your hands. Producing the amount of work you do while also mothering 4 boys is amazingly impressive! I would imagine you must be pretty organized to pull it off. How important is organization in your work, and can you share any tips for keeping on track and getting things done? CF: Organization is very important to me, I’m a big list maker! Before I finish at my desk each day I try to create a new to-do list for myself for the next day so that I can jump right into work rather than trying to remember where I was. This also helps with time management as my time is often broken up into small chunks; if I know I’ll be waiting in my car for an hour I’ll check my to-do list for a portable job that can be done in that length of time. It does mean that I’ve got overflowing lists everywhere, my desk, phone and even random notebooks in my handbag. I also try to break down my design work into all the steps that have to be done; so I’ll start with swatch/sketch, then move on to sizing and the basic pattern. Once that’s done I’ll knit the sample, rewriting the pattern as necessary. Finally, after blocking gauge is double-checked I finalize the pattern and draw the schematic. Each of these steps is written down and crossed out when done. This is extra important when working on a book so you can see at a glance if some step has been forgotten. This organization doesn’t always come naturally to me. My desk is a towering mountain of paper and yarn and I eventually gave in this year and got some help with cleaning. I’ve come to accept that there are so many hours in the day and there is physically no way to do everything so you need to prioritize and get help when necessary. JF: How has your work changed since you began pursuing this career? What lessons have you learned that you might like to share with younger designers who are just starting out? CF: I think my basic design aesthetic hasn’t changed dramatically over the years, although I am finding myself drawn increasingly to cleaner lines with interesting construction methods. CF: The art of pattern writing is learned by trial and error. When I began designing there were sometimes ideas I had to abandon, as I didn’t yet have the pattern writing skills to write them as a multi-sized garment. This is something important to realize as a new designer, it takes a whole lot of practice! This means writing and re-writing patterns frequently. Tech Editors are fantastic; they can really help you improve your pattern writing. Test knitters can also help in this, when a knitter is giving you feedback as they work through your pattern you see it through another persons eyes. So it is a constant process of evolution, learning from past mistakes and figuring out better (and clearer) ways to write. 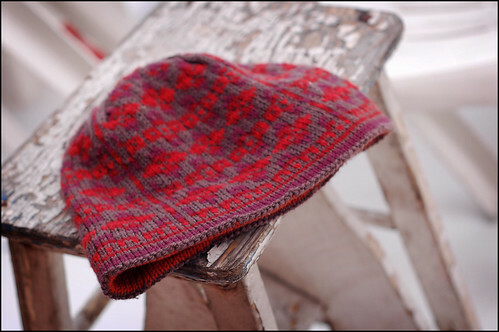 JF: I definitely agree – whether it’s a tech editor, or a test knitter, once you are far enough along in the process you need a few pairs of fresh eyes to look at the work and give you feedback. After writing (and especially grading) a pattern, it’s easy to miss the forest for the trees, as the saying goes. CF: Writing for different publications helps with this as well. Every publication has a different style guide that you need to work with. While it’s time consuming it can also be a learning process, potentially improving your own self-published style guide. JF: “Pente” is your third contribution to our Wool People series (Hathaway from Wool People 4 was your first, and Carpino from Wool People 6 your second, last Fall) and everyone here really loves this cardigan. Where did your inspiration come from for Pente? CF: Over the past year I’ve been fascinated with biased fabric. It started with Vertex Cardigan for Interweave last Spring. The increase line at the center of the back creates an arrow effect with the lightly variegated yarn but I wanted to explore it further. The next biased garment I did last summer was Nishibi which used a biased central panel in ribbing that created a diagonal effect again with just increases and decreases. The idea for Pente came after that; I wanted to create a dramatic front drape on a cardigan primarily using biasing. JF: The construction of the garment also makes this cardigan special – I love that you chose to use a subtle striping sequence to highlight the directionality of the fabric. CF: The subtle color striping in the fabric really helps to emphasis how the direction of the fabric shifts from front to back; it makes it easy to see how the use of increasing and decreasing dramatically shapes the fabric. JF: Can you give our readers a brief explanation of the overall garment construction? CF: I love seamless designs; to me they really utilize the flexibility of knitted fabric. This design is worked seamlessly in one piece from the bottom up. It starts with a clean turned hem at the bottom, which allows us to echo the stripe color. From here the front panels (which are extra wide to allow a flowing front drape), are biased using increases and decreases along the side seams. The stripe sequence is worked in subtle colors which make it quite understated. It would be very easy, though, to change the colors used for a more dramatic effect, even blending from one color on the bottom to a different one on the top for an ombre effect. CF: Once the body is complete the front and back of the yoke are worked separately. I’ve used short rows to create shaping for the sleeves, so that both the cuff and top of shoulder fit well. Short rows are also worked along the front so that the biasing doesn’t impact the fit at the top of the front. Finally this cardigan is finished using a Joinery Bind Off across the top of the shoulder in the contrasting color. I love the crisp clean line it gives that really feels like it finishes the garment off perfectly. JF: It’s very smart and well thought out – in my mind, that is always the mark of good design – bravo! What is next for you? Any future projects you can share with us? CF: I’ve just recently signed a contract with Potter Craft for a new book that will be released in Fall 2015. The complete book is due in August this year so I’m very busy right now! I’m so excited to see this project in its finished form; it’s a topic I’m very passionate about and it should make a great book. In a shorter time scale, I’m also getting ready for a Summer KAL with Briar Rose Fibers. I did a KAL with Chris in the Fall of 2012 and she was just lovely to work with so I’m really looking forward to the KAL. Now I just need to get time to write the clues between book projects! JF: Sounds exciting – best of luck with your upcoming projects and thanks again for taking the time to chat with me today! So I’ve thrown open all the windows and spent the week enjoying sunlight and the fresh smelling air and zoning out on some mindless knitting. Night after night its been stripe after stripe of Noro and you know what? It’s been wonderful. I’m finishing up my fourth ball of yarn and I’m still happy watching the colors change both inside (in my knitting) and outside (spring!). Not to mention the million-dollar light that has been pouring in through the windows every afternoon. In many cases I’d consider this a knitting lull, but it isn’t. When I need something more than meditative, I’ve got my new sweater at the ready, although that too is growing organically and without hurry. The sweater you see here is (the start of) Scott from RYC Classic Winter. The pattern is pretty fussy, in my opinion, so I’m making some pretty broad simplifications (mine will be completely seamless, and as a result, so much less stressful). Some super-soft, chunky colorwork in nice muted colors is just what the doctor ordered for relaxing window-side on the couch. 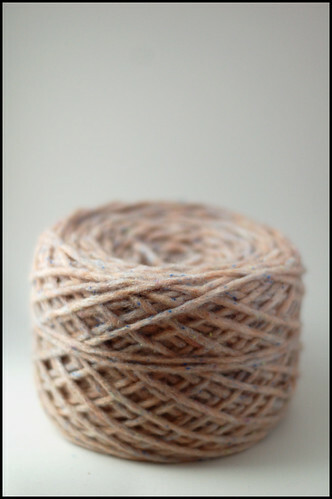 And for the record, the yarn is as light as air. I’m sure it’s just a matter of time before the intensity will kick back up again, but for now I’m gonna zen-out with my needles and relax. Have a great weekend. I’m happy to report that I’m knitting for pleasure full-time again. The last couple of months have been a little dicey with some extra-curricular knitting , but I’m safely back on the fast track to a more relaxed (deadline free) knitting schedule, at least for the time being. This weekend I’ll be zoning out on stockinette and getting reacquainted with The Swisher. I love picking up an in-progress project after its fallen off the radar for a few months. In a way, it seems brand new again – this time there’s only half a sweater to knit, though. Kind of feels like cheating. Don’t mind me, I’ll be the one happily knitting in the corner. The project that has served most useful to me this winter is, hands down, Red-Light-Special. I loved it even before the vindictive cold snap hit, but over the last few blustery weeks we’ve become inseparable. The stranded fabric + the extra ear lining keeps my ears very happy when the winter winds whipping up Columbus attempt to ruin me on my morning walks to work. I didn’t realize how toasty this thing was until I put an older, single-layer knit hat on my head when I went out the other day and experienced very questionable protection from the cold. Why am I telling you this? Mostly because I want to introduce some of the other wonderful versions of the pattern that have been cropping up around the internet. 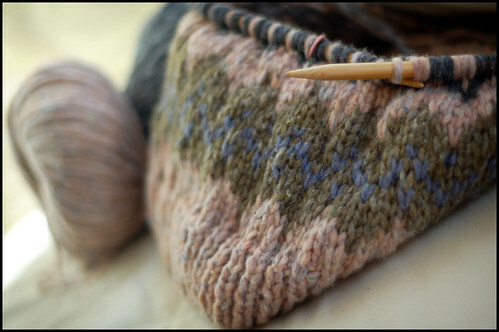 It’s such a wonderful thing to see each one done in colors that suit the individual knitter. I’m endlessly entertained by all the color experimentation. If you’ve made one, or are currently, and you’re a flickr member (or junkie, like me) please join the group! If you’re not a part of flickr but want to share your photos, please send them to me via e-mail and I’ll post them for you. And thanks again for everyone who has sent in finished pics, I’ve really enjoyed seeing everyone’s individual take on the pattern.